The art and science of self-transformation is based on the personal natal chart or horoscope. It is the art and science of unfolding your potential and the development of higher states of consciousness. It is the turning of lead into gold or turning of darkness into light. Our negative karmic patterns of thinking, feeling and action must be consciously transformed into positive patterns of thinking, feeling and action. Negative karmic patterns identify trapped consciousness or light that must be transmuted and allow the inherent light or consciousness to shine as expanded awareness. This is based on the personal natal chart which is a map of the soul and our karmic inheritance from past lives. Properly understood, it is your road map to higher consciousness if you choose to take advantage of the opportunities for growth. The transits and progressions identify the most propitious timing for taking advantage of growth opportunities and the most effective timing for instituting change in your life. The people, circumstances and situations in your life are manifestations of your karma. When a crisis occurs our negative karma is activated and we are being tested to see if we have learned our lessons related to our negative patterns of thinking, feeling and action. It identifies the opportunity to change our reaction response from a negative to a positive and thus heal our negative karma. Crisis is opportunity. Knowledge is power. It is your choice whether you live a life of struggle and disappointment or a life of happiness and fulfillment. Call for an appointment today and begin to change your life now. In Greek mythology, Uranus belonged to a race of primordial gods born out of chaos. His wife, Gaia, gave birth to the Titans, who eventually overthrew the older gods. Among the Titans was Cronus (Roman Saturn), who ruled over a Golden Age during which laws weren’t needed, because humans knew how to get along with one another. Cronus and the Titans in turn were overthrown by Zeus (Roman Jupiter) and the gods of Olympus. From that time on, humans fell further and further into depravity, with war as their main purpose. According to some versions of the myth, the goddess Astraea ruled with Cronus but became so disgusted by human greed and violence that she fled to the stars and became Virgo, holding the scales of justice, the constellation Libra. During the intense aspects of the past four years, particularly the Uranus-Pluto square, humans have been under sustained stress that at times has been almost unbearable. There is a theory that environmental stress can cause species to mutate and evolve very quickly. I see a strong possibility that we’re in that phase now and heading for a mass shift in consciousness as the “old gods” are overthrown. This seems to be the recurring theme with the Uranus-Pluto revolutions. Uranus in Aries leaps into the revolution demanding “freedom” and thinks about the consequences later. Initially, I thought of Pluto in Capricorn as the police firing into crowds of protesters, and that has turned out to be true. However, it’s starting to look like Pluto in Capricorn also represents the ruthless and more-sophisticated financial interests that are using the chaos (and probably helping to instigate it) to profit from resources that rightfully belong to the country and its people. Further, these corporate interests are global and in some cases are the same players from one country to the next. Impulsive Uranus doesn’t have the patience to “know the enemy,” form a solid strategy, and wait for right moment to strike. Essentially, it’s youth and enthusiasm against age and experience. The idea that Pluto in Capricorn represents global corporate and financial interests means that the conflict is bigger than just Libya, Ukraine, Venezuela, or wherever “assisted” revolution breaks out next. Despite what I wrote above about Uranus in Aries, this planet-sign pair also is a signature for awakening consciousness. There’s still another year and a half of the Uranus-Pluto square. That’s enough time for a mass awakening that in turn leads to a global shift toward a more sustainable way of life. The planet of luck and higher mind, philosophy and beliefs, Jupiter has been retrograde since November 7, 2013, during which time we’ve been turned inward. When Jupiter is in retrograde, the action of Jupiter is reversed so that the emphasis is upon inner awareness and inner growth. We’ve been looking within ourselves for answers instead of seeking them in the material world, but all that will change when Jupiter goes direct on March 6, 2014 on the 10th degree of Cancer. Jupiter in forward-motion promotes activity and going out into the world, so we’ll now put what we’ve discovered about ourselves into motion and actively change our lives for the better. Being the largest planet in our solar system Jupiter symbolizes expansion, growth, abundance, generosity and extravagance. As father of Athena, goddess of wisdom, Jupiter also symbolizes philosophy, knowledge, theorizing and teaching. Therefore, Jupiter is related to studying, opening one�s intellectual horizons and making discoveries through both travel and research. As leader and legislator of the Olympian gods, Jupiter is further connected with the law, morality, justice, the meaning of life, religion and believing in a higher purpose. As benefactor of the gods following the successful outcome of the battle which he led against Saturn and the Titans, Jupiter is related to luck, improvement and favorable fate. Finally, Jupiter�s initiative to fight against the Titans, a venture that seemed doomed to failure from the outset, has associated this planet with risk, optimism and wanderlust. Traditionally Jupiter is said to be in exaltation in the sign of Cancer and is thus able to express its maximum potential as a planet. Anything we start during this time is likely to bring success. The shift into the sign of Cancer becomes very important as the emotional sign of Cancer rules home, family, and emotional security. Your focus will most likely shift to this area of your life to bring the important elements into your life as they pertain to the sign of Cancer. With the New Moon in Aquarius on January 30 we are seeding the unfoldment of higher consciousness. Aquarius is the sign of the zodiac that rules the goal of human evolution. This more expanded state of awareness of self realization, enlightenment and cosmic consciousness is what our nervous system is designed to express. 2014 and 2015 are the turning point in terms of accelerated unfoldment of these higher states of consciousness. Aquarius and its ruling planet Uranus embody a very high vibrational frequency that will shake up the lower vibrational frequency states of consciousness that have been so dominant in the world for so long. It is a time of enlightened change. This New Moon is planting the seeds of this process that will continue to unfold during the rest of the year. The keyword for this New Moon in Aquarius 10 degrees is Inspiration. It is about giving us a shot of divine inspiration to lift us up out of the mundane and give us a taste of the celestial that is the ultimate reality. So take the time to meditate and Be in order to consciously connect with this energy. You will be glad that you did. Of course there is resistance to this energy of enlightenment and freedom. There is a great deal of conflict trying to make it so that you don’t see what is really going on. There is a grand cross consisting of a Venus/ Pluto conjunction opposed by Jupiter and Uranus and Mars are opposed to each other and squaring Jupiter and Venus/ Pluto. These planets are all in cardinal signs which is about power struggles. This planetary configuration represents a great deal of unrest and conflict. Just look at the world headlines. But the Light will ultimately come out on top. The Full Moon is in Leo 26 degrees this month on February 14. This crescendo of energy is wanting us to blossom and flower into who we really are. Leo rules the heart chakra and the Moon being here is challenging us to open up our hearts. Love is a cosmic force which has the alchemical ability to change anything and everything. The keyword for this Full Moon is Ambition. This consciousness is about being all you can be and shining as brightly as the Sun. Shine you light and express it through benevolent action. There is still a lot of conflict going on and it will be accentuated now with the climax of the waxing phase of the Moon. The Venus/ Pluto conjunction is opposed to Jupiter and Uranus squaring Jupiter and Venus / Pluto continues to stir up unrest and conflict. A second T-cross has been added to the mix. The Sun/ Mercury/ Neptune conjunction is opposed by the Moon and Saturn is in square aspect to all these planets. This represents the established power structure trying to keep orderliness and control of an increasingly volatile situation. Hang onto your hats. Please keep in mind not to go into fear. In the big picture something good is happening. It is a time of cleansing and purification. As the Light rises there is going to be unrest and change. “As the first week of February drifts by, the tension surrounding Mercury’s upcoming retrograde grows and the lost phones, botched plans and general confusion mount. On the 6th, Mercury actually assumes retrograde motion and disappears from the nightsky shortly thereafter. Mercury’s retrograde begins in the murky depths of Pisces, but the messenger’s journey will pull him out of the brackish waters and back into the cold, dry air of Aquarius. Metaphorically, this retrograde is a plunge into turbulent emotional and spiritual territory, followed by a retreat to more logical terrain. Mercury will be retrograde until the very last day of the month, February 28th. Do the Math. See the Future. Numerology is a divination method based on the Wisdom of Numbers. Long ago, in Ancient Greece, Egypt, China and many more great ancient civilisations it was believed that the harmony of this Material World is constructed on numbers. Everything that is created, has been made, or going to be born hides a hidden numerical nature. Knowing how Numbers work we can foresee the past, present and future of everything and this is because everything works on the same numerical pattern. A pattern familiar only to the Wise ones. This is why only the privileged ones could have access to this knowledge. As Pythagoras stated and the Jewish mystical system known as Kabbalah continued, every word, every name, everyone and everything relates to a certain number thus to certain qualities, abilities and a destiny. So what Numerology tells us about the new year which approaches? 2014 will be a dynamic year that will set many things in motion. Let’s talk about 2014. With the difficult astrology in the works for the first half of the year, I wanted to take a moment to break things down — not to make you anxious or fearful, but so that we’re all on the same page and, more importantly, that we create the highest good. In astrology, a cardinal grand cross formation is one of the most difficult alignments. It happens when four planets hold the same (or close) degree in the four cardinal signs of Aries, Cancer, Libra, and Capricorn — each planet making a 90 degree angle from each other. Not sure what I mean? Just think of a big square in the sky and you’re in the middle and everyone is arguing around you; everyone has their own agenda and not cooperating. It would be hard to be in that vortex of energy, right? From January 2014 to July 2014 there will be a cardinal grand cross in the sky. This is big news not only because of the duration (approximately six months), but because of the heavyweight players involved — Uranus, Jupiter, Mars, and Pluto. What does this mean? Change. Total gut level, hyper focused change. I know, you’re tired of change. You’ve been doing change since Pluto went into Capricorn in 2008 and Uranus entered Aries in 2010/2011. And if that wasn’t enough, the last couple of years have been particularly difficult as Uranus and Pluto expanded and contracted in tight square formation, rippling seismic waves out across your life. So, here comes Mars (action, aggression) and Jupiter (expansion) to join the party, lining up around 9-13 degrees of Libra and Cancer. On top of that, we have a pair of eclipses in April, which will move events along. Awesome! Here’s the thing — if you’ve been doing your work, clearing, healing, moving forward into new territory, getting rid of fears, leaving behind dualistic thinking, and embracing this fuller version of yourself, then the spring (or autumn if you’re in the southern hemisphere) may be exhilarating — a time when all those things you’ve been working towards are that much closer. But if you’ve been holding onto your old life, held back by fears, caught in the illusion of the 3rd Dimension, then the grand cross will bring a lot of energy to the surface for release and healing. The peak of the grand cross in March and April will feel like a centrifuge. And if you’ve ever seen one, the spin of the vortex pushes density up and out. So all this 3rd dimensional density is going to come to the surface, pushed out by the cardinal grand cross. It will also be a real testing point — are you still living in 3rd Dimensional energy or are you stepping into the heart centered creatorship of the 5th? This isn’t easy business. It’s spiritual mastery in action. But don’t forget, we are all spiritual masters made physical. We can’t forget that. For some of you this is old hat while others are just waking up to this reality. If you’ve been hitting the snooze button, this spring it will be time to wake up. 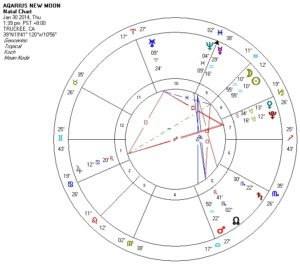 On New Year’s Day coinciding with the new moon in Capricorn, the grand cross between Pluto-Uranus, Mars-Jupiter, heralded how 2014 will shape up. Again, in the full moon chart for Capricorn (January 16), the grand cross is still activated, but evolves to an exact focus, April 22-24, 2014. The 2014 Grand Cross raises to a greater prominence than ever before, the ongoing square between transiting Pluto and Uranus. April 2014 will be the fifth of seven exact squares that started June 2012 and finish in March 2015. The third and fourth hits were in 2013, hence 2014 represents just past the half way mark of this long initiatory passage. To use a first ray term connected to the planet Vulcan, the 2014 Grand Cross drops the hammer upon the entire period from 2012-2015. The first ray of will or power is one of the rays that pass through Capricorn. The Capricorn 2014 new moon missive­ is repeated and embellished here, because it applies to the whole year, particularly the cardinal Grand Cross of April. “We reflect upon the year’s achievements in the sign of Capricorn, the mountain top of material and spiritual achievement. We ponder our failures and make new year’s resolutions; we resolve to rectify wrongs and renew our ‘vows’. We reflect, resolve, and renew – relinquishing regret; not unlike the soul’s journey passing into the afterlife. Capricorn is one of the signs of death, of completion, yet the doorway into renewed life, hence Janus and January. Capricorn is a sign of initiation into the mysteries and Saturn it’s ruler, currently in Scorpio, ensures that humanity will have to raise its game in 2014. Individually and collectively we will all be required to tread the burning ground of the lower self, yet also ‘stand our ground’, claiming the new ‘territory’ that our greater Self has ‘captured’; this will be achieved through honest self-reflection and an utter ruthlessness – rooting out all that impedes individual progress; and in the groups with whom we are associated. Yet, this planetary configuration holds a reward for the requisite labour it sets before us. There is turmoil in many nations, from Egypt to Thailand, Ukraine to Bangladesh, Sudan to Syria, as the struggle unfolds for freedom from repressive power systems and governments. There will be much more of the same in 2014, including many strains in all the dysfunctional Western democracies. The next two years will be an extremely difficult period as Humanity seeks to make a quantum leap through a brief window of time, to overcome centuries of inertia and crystallisation. The resistance to these opportunities for change are so deep-seated, one can almost hear the wheels of the great cycles Pisces-Aquarius, grinding and groaning during this cuspal period. 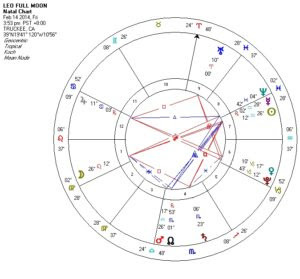 The imminent grand cross of Uranus-Pluto, Jupiter-Mars in cardinal signs, dominates 2014 and will be laying waste to the past as never before, indicating a kind of crucifixionfor humanity, as it faces more directly, the planetary Dweller on the Threshold. Grand Cross set for London, Britain. Rising sign will vary according to location. The various themes of money and its fairer redistribution, critical environmental and agricultural concerns, bees, pollution, food production and distribution, hunger and malnutrition, radical weather, natural cataclysms, nuclear weapons in the Middle East and/or nuclear accidents such as Fukushima, may all reach critical mass in 2014. Mars in Libra will be a positive driving force as the god of war in the sign of peace, unrelenting in negotiations, regime change and détente. (Think Nelson Mandela and the Dalai Lama, both with Mars in Libra.) Mars in Libra is about holding one’s enemies close and to be vigilant for the ‘frenemies’. Yet Mars’ square to Pluto and opposition to Uranus is highly volatile. If not handled correctly, these extraordinarily powerful forces will burst out in unpredictable ways around the planet, like the recent massive train explosion in North Dakota, following several other unprecedented explosions in the past year. Of course, New Year is based upon the traditional Western calendar; it is pertinent and important, but the real new year starts in March in Aries, the first sign of the zodiac. From Aries, the initial annual impulse gestates for nine months before birthing in Capricorn. The latter is an interesting phrase as Capricorn’s polar opposite is Cancer, traditionally the sign of birth, whilst Capricorn is a sign of completion and death. Aquarius following Capricorn allows for the new year’s resolutions/revolutions to be set, whilst Pisces hosts the dissolution of the annual cycle in preparation for the new cycle beginning in Aries. The “final revolt” takes place at the ‘reversal of the wheel’, when a soul starts to tread the way to greater consciousness and freedom. Humanity en masse, is currently reversing the wheel, hence the ‘grinding gears’ and their urgent maintenance – the oil of human compassion. Where there are mountains there are valleys. If Capricorn is the mountain top, then Cancer is the valley, full of the waters that hold the seeds of life. Yet, as discussed previously, Cancer is the ‘place of death’, reminding us of that sublime Psalm 23, “Yea, though I walk through the valley of the shadow of death”. This is descriptive of the vales of illusion that humanity inhabits, yet holds within it the promise to be led “beside the still waters”. Capricorn the mountain, Cancer the valley, the womb. The veil/vale pun describes the ‘veils of illusion’ that the spiritual aspirant is constantly challenged to destroy, yet ‘vale’ is an old word that means, ‘a valley, often coursed by a stream’. The ‘still waters’ are symbolic of the astral body being brought under control by the aspirant, the main ‘mountain’ for most, culminating at the second initiation. (Capricorn’s symbol of the sea-goat hints at this.) Cancer as a water sign is most symbolic of the amniotic fluid and the ‘breaking of the waters’ at birth, yet also the waters that must be eventually stilled, or distilled in the laboratory of life. The ‘house of the Lord’ is occultly speaking, the ‘temple of the Lord’, the ‘mansion of the soul’ or the causal body, whilst the cup (the chalice of the heart), ‘runneth over’. Capricorn is a cardinal sign, the four signs of the cardinal cross are about initiating purpose and plan. A purpose that is initiated in one lifetime or another, culminates eventually in an incarnation – as initiation into a broader realm of consciousness. It is worth bearing in mind on the long journey humanity treads (or staggers!) toward liberation, the successive steps that bring integration within the lower self/selves and subsequent alignment with the Higher Self. “The attempt today to climb Mount Everest is amazingly symbolic, and it is being watched with much interest by the Hierarchy [the ‘greater Lords’], for in this effort we see the attempt of humanity to achieve the top of the mountain whose height has hitherto defeated all efforts. L: Sir Edmund Hillary atop Everest. R: With Tenzing Norgay: East meets West, to scale the summit. This ‘new civilisation’ is the emerging Sixth Rootrace which the impending Aquarian Age will catalyse. The mountain top achieved is the ‘5.5.5’, the fifth branchrace of the fifth subrace of the Fifth Rootrace, the development of the mind, at least for a significant portion of humanity. The ‘underworld’ is where the battle is on in earnest now, it is the domain of the dweller on the threshold for humanity; it is this battleground or kurukshetra that will be at the forefront of human affairs in 2014-2015. The ancient testings for initiation used to always take place in the dark, where the candidate had to struggle through many trials toward the light. The global problems listed earlier are the trials we face today. “The building of adequate forms and the use and control of form are essential if there is to be wise and right cooperation with the Plan of God. Jupiter guarantees this in Cancer from the very initial stage of birth. Love as relationship to divinity and wisdom as relationship to form, lie behind the soul’s intent. In space and time, for long aeons, form controls and hides the soul. In this dramatic transition period, Humanity is gradually emerging from being ‘lost in the mass’, embracing a more individualised soul expression, learning to think independently, hence the proliferation of ideologies and beliefs. Again, the phrase ‘final revolt’ comes to mind, as an increasing awareness is now filtering through about how much humans are being manipulated by one another. The planetary situation is ‘revolting’, (i.e., it stinks! ), and individuals are not ‘revolting’ through social disobedience because they are blind to their manipulation, or complacent and hypnotised by the bright baubles and toys of materialism. Uranus may bring on a global ‘popular revolt’, only now expressing itself through several nations. In the 2014 Grand Cross configuration, Jupiter in Cancer may exacerbate the materialistic appetites, particularly sugar consumption and obesity. This trend to add sugar to all foods most likely started in the USA, a nation that has Jupiter in Cancer. The wealth and excess of the USA can be likened to jumping into a large swimming pool full of flummery or blueberry cheesecake, sweetened to the max! This sugar problem has reached epidemic proportions worldwide and various nations are scurrying to address the problem. Yet vampire corporations that have foisted their poisonous policies upon the world, are still being allowed to behave irresponsibly; they hold an unfair advantage of people’s power of choice. Hence, Jupiter opposite Pluto in the 2014 Grand Cross may shed more light upon this power dynamic: Pluto in Capricorn, the powerful corporate interests that dictate to governments, versus Jupiter in Cancer in one of its expressions – the mass consumption of sweetened food. Sugar is at the epi-centre of the human desire nature. That epi-centre is actually the solar plexus centre, the seat of desire, the astral body, the source of all addiction. Excessive sugar ‘ages’ the pancreas, the endocrine gland associated with the solar plexus centre, and which plays an important role in glucose metabolism, the regulation of blood glucose. Aged pancreas = diabetes, another global epidemic. Addiction is a way of feeding the hungry heart, and combined with something physically addictive, is a lethal combination. Solar plexus chakra. Pancreas with Islets of Langerhans. The solar plexus chakra is a ten-petalled lotus, whose perfection corresponds to the tenth sign Capricorn. The energy that pours through the solar plexus is transmitted through the most esoteric portion of the pancreas, the Islets of Langerhans (sounds like a holiday destination! ), that produce hormones which underlie the endocrine functions of the pancreas. The quality of the hormones produced is dependent upon the emotional state of the individual chakra through which energy pours, the ray that conditions the astral body, the spiritual stage of unfoldment and of course the physical condition of the individual. These hormones then circulate throughout the whole body, creating – living! If 10 petals of the solar plexus are added to the 12 petals of the heart centre, when solar plexus and heart have achieved right relation, there are the 22 major arcana of the Tarot. Ironically, Jupiter rules the heart centre and Cancer is one of the most astrally sensitive of all signs. There is a deliberate and pre-meditated, hence criminal, perpetuation of addiction by corporate interests, making huge profits; keeping the masses trapped in an endless cycle of advertising, consumption – and financial slavery to an increasingly corporatised medical establishment; it’s the over-consumption of everything, not just sugar; it is the West’s version of mal-nutrition, contra-distinct to starvation and famine with which we normally associate. The West is experiencing a spiritual starvation and famine, refugees of the heart staring into an abyss, stuck in the cul-de-sac of selfishness and self-absorption, yet earnestly searching for the elusive heart. Past fears, survival issues and desire have to be replaced by faith in a future of courage; it is Humanity’s dark night of the soul, which always precedes illumination; this is why the 2014 Grand Cross will be such a defining moment in history, as Humanity faces its shadow. The infamous and amusing phrase from the French Revolution, ‘the peasants are revolting’, is a great metaphor for awakening humanity, spiritually impoverished and starving for light. Yet, it is also an appropriate allegory for those who have awakened, still struggling with their imperfections. One definition for peasant is, ‘coarse, unsophisticated, boorish, an uneducated person’, highlighting again, the soul’s power to continually refine the substance of its vehicles, its ‘peasant lives’, to train and ‘educate’ them through the various spiritual disciplines available. When the soul or ‘lord’ takes control of its ‘peasantry’ (esoterically, the armies of deva lives that constitute the lower self), then the domain of the spirit will reign. Then we can all say, “Let us eat cake!” The royal or ‘ruling class’ of the soul will be in control and peasant may well be transformed to pleasant, ‘gentrified’ if you will. A few ignorant deva lives … some serious inner gremlin training needed here! As discussed in the Tsunami newsletter of 2011, Japan is a Capricorn personality and also Capricorn rising in its exoteric chart for 1952. Part of the cause of the ongoing problems in Japan, is Pluto’s transit through Capricorn. Pluto is the co-ruler of the first ray of will or power, the soul ray of Japan. The head is where spiritual force is directed from Planetary Hierarchy – Sanat Kumara, the Masters – who are in close physical proximity. The throat is the where the mental body is anchored. Britain is the seat of the developed concrete mind for the Fifth Rootrace. Expressions of the heart: Red Cross, United Nations, Human Rights groups. Many agreements made here. 730 years democracy. After purification, the solar plexus irradiates the soul’s love through the personality, reflecting the light of the soul. Note that Tokyo is the only city/chakra ‘below the diaphragm’. Globally, the solar plexus of Tokyo functions as a transformational agent of the collective emotions of humanity, a vast cauldron of varied ingredients. If Tokyo is the solar plexus, then Fukushima may well be the ‘Islets of Langerhans’. The radiation leak could be viewed as the toxic condition of Humanity’s astral body, yet also a ‘radiation therapy’ that destroys the cancer; an homoeopathic remedy of small doses perhaps. Most of humanity see radiation sickness as a disaster because of its impact upon the transient human form and this is true, if we get too much of it. Currently many US sailors who helped out just after the tsunami have become very sick with radiation poisoning. Yet there were many survivors of Hiroshima and Nagasaki who went on to live long lives, one individual who was in both cities at both blasts, died at 93 of old age! The reader may have some strong reactions to the following statements, but they are worth reflecting upon. Japan was the nation where WWII was ended through atomic bombs; where the resistance of the powers of evil was ended, because the atom bomb’s potency is mainly etheric. Fire is purificatory and purging. Interesting to note there is currently debate about whether the bombs needed to be dropped but were released anyway, as a way it is speculated, to send a message to other nations who were potential enemies. Below we can see the beauty and mystery of the atom mandala, the basic unit of matter, the building block of life – carbon 12. Six protons, six electrons and six neutrons = 666 the number of matter (the ‘beast) on the three lower planes. The triangle is the divine trinity reflected in all matter. The proton is the (+) charge, hence the first aspect/ray. The electron is the (-) charge – the third aspect/ray. The neutron is the uncharged particle and assumes the second aspect/ray. “A period of radioactivity is being entered upon now in which men and women will achieve a larger realisation; they will begin to transcend their human limitations, and to enter the fifth kingdom [of souls] one by one, and unit by unit. This period, as far as the larger cycle is concerned, began when the Door of Initiation was opened in Atlantean days, but many lesser cycles have occurred, for the influx into the fifth kingdom is equally governed by cyclic law, by periodic ebb and flow. … Another period of radioactivity occurred during the time of the Buddha and many achieved Arhatship in those days. That period was the highest point of what is occultly termed “a cycle of the third degree,” and a similar degree of radiatory activity has not been reached since that time. Human radiation of a very slight nature was felt about the time of Christ, but it only lasted for a couple of hundred years, and though individuals here and there have since achieved the goal, yet no large numbers have passed successfully through the fires of transmutation, and thus transcended the fourth kingdom. This period is now upon us. The 2014 Grand Cross powerfully stimulates Japan’s horoscope, possibly triggering another tsunami and more radiation leaks. Transiting Uranus: Conjunct Mercury in Aries. Transiting Mars: Conjunct Saturn in Libra. Transiting Jupiter conjunct progressed Uranus in Cancer. Transiting Pluto conjunct Chiron in Capricorn. There is a high probability for Japan having to cope with natural disaster and ongoing radiation fallout; as well as its power struggles and territorial disputes with neighbours such as China and North Korea, both with nuclear weapons capability. The theme is very much Pluto in Capricorn and the right use of power on all levels. The New Group of World Servers has a great responsibility in the next few years, to hold these global events in tension, both subjectively and in their outer communities. May Pluto empower us all and Uranus bring the revolution in consciousness that we all seek. Have you been meaning to get an astrology reading but have not got around to it yet? Or thought it about time you had an update? Find out your higher purpose and the choices that are available to you, through a soul-centered reading. Phillip Lindsay has been practicing astrology for thirty years, using the rays and esoteric techniques of interpretation to guide his clients along their way. Click here to book a reading, here for testimonials. I came to your blog by chance looking for the language mystery, thanks. I am an information hound, if you want more, contact me. Have some good stuff on where I think we should consider to go tech and social wise. Thanks for such an awesome blog,This is my third visit to your site and really enjoyed it.